In far-off Minnesota, my favorite blogging baker and bon vivant, Eileen of Passions to Pastry, posted a recipe that called to me: rustic rhubarb – almond cake. (Full disclosure: all of Eileen’s recipes call to me.) But a trip to my over-harvested, under-watered rhubarb patch showed me that a substitution was in order. Dry, stringy, tough rhubarb has little appeal in any recipe or for any palate. Preheat oven to 350 degrees F, butter one ten-inch springform pan, dust with flour, tap out extra. Pit one pound of Rainier cherries. (Other cherries work fine, too.) Set aside. Whisk flours, baking powder, and salt until mixed. Empty into bowl. Mix 1 cup butter and 3/4 cup sugar until smooth, add extracts, mix on medium until incorporated, smooth, light and fluffy, about 2 minute. Add eggs, one at a time, beating to blend first egg before adding second. Beat until mixture is pale and fluffy, about 2 minute. Gradually add dry ingredients, followed by yogurt. Continue mixing, scraping down the sides of bowl as needed, just to combine (batter will be thick). 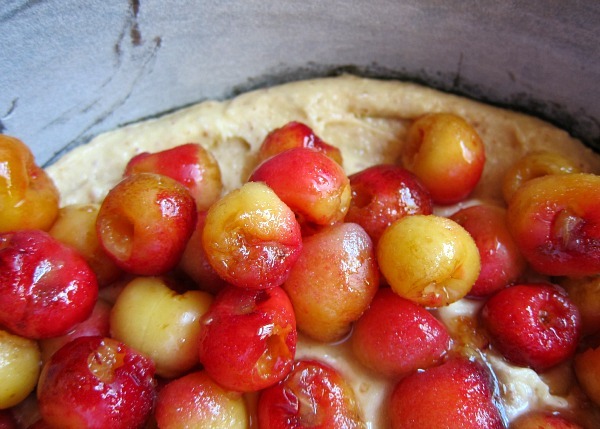 Fold in half of the pitted cherries and scrape batter into prepared pan. Smooth batter and arrange remaining cherries over top. Sprinkle with three tablespoons sugar. 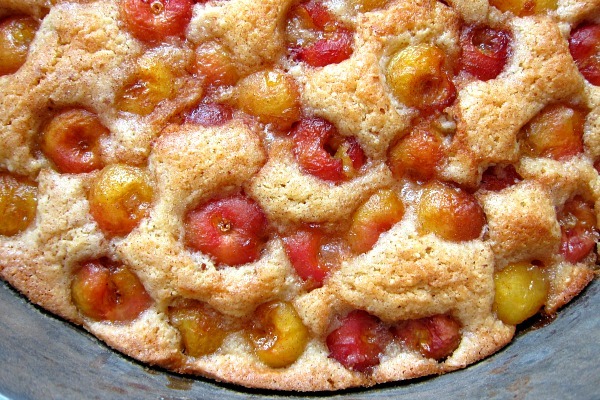 Place springform pan on a large rimmed baking sheet (to catch any rogue juices) and bake, rotating once, until cake is golden brown and cherries are soft, 60 - 70 minutes. Transfer to a wire rack and let cake cool before removing from pan. 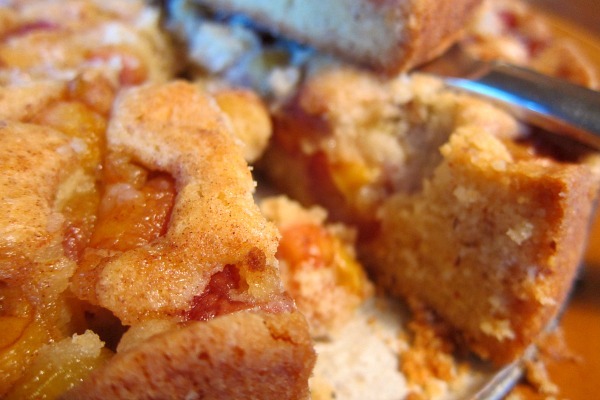 Try this recipe with any seasonal fruit; I’m sure you won’t be disappointed. Oh, and thank you Eileen; bake on, bake on! Perfection and oh my, how I would love a taste. 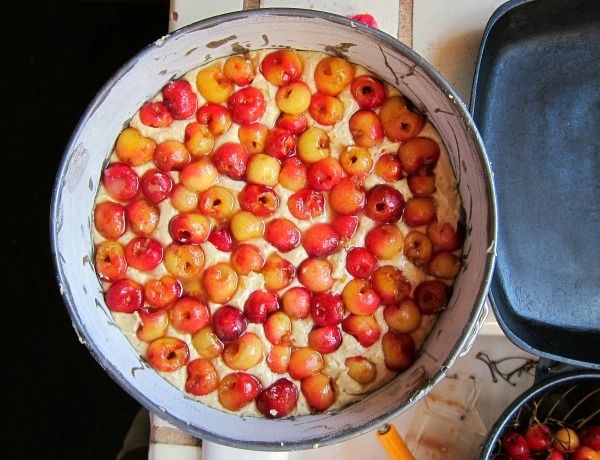 Funny you should post this because last week I made a sour pie cherry upside down cake and it was fab. That looks wonderful. I’m off to find some cherries. Thank you so much! We have Rainier Cherries at our grocery store here in Phoenix. Must make this tomorrow! Tom, in step 3 it calls for baking powder but doesn’t give an amount in the ingredients list. Help! Sorry Doug, I just corrected that; it should have shown 1 teaspoon. That looks SO delicious, Tom. The recipe for the batter sounds really good too. Lucky you that you have help with the pitting! A few years ago I went cherry picking with several women in Tehachapi, CA because a friend had many trees with ripe cherries, so and before the birds ate them all, we were invited to pick them for free. The birds know when they’re ripe, trick is to time it perfectly. Here we were about 6 women with our step stools and ladders filling buckets of cherries at 6 AM on a beautiful day — it was a lot of fun. The downside for me is that I mentioned that I would be making jam, and that’s when I was given extra buckets of surplus cherries the women picked so I could make some jam for them. Keep in mind, I’ve made every jam under the sun, but not cherry jam. I didn’t even own a cherry-pitter, so with just a paring knife I spent hours and hours pitting cherries to make jam. All I could say was, what was I thinking? Boring, tedious and not fun at all. Funny story Cindy, and I hear you. Most folks don’t know how much time is involved in making a good jam. I hope you were spoiled with some reciprocal goodies or at least lunch out for your labors. Plus cherries don’t have much pectin so it’s hard to get a good set with them. What a great looking rustic cake. Can’t wait to attempt one with fresh cherries -perhaps even sour cherries if I can find any at the farmer’s Market. Rob, sour cherries sound like a great option. 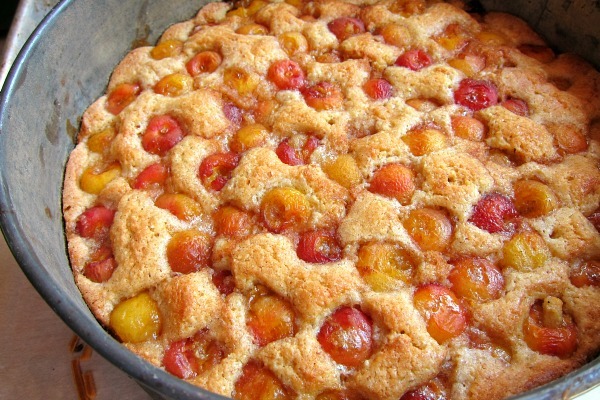 I’m going to try the cake using apricots, this weekend. your website is a perfect frame for a lovely summerday like this (here in Austria at least)! Thank you Mica. How fun to hear a voice from such a beautiful corner of the world. I, too, am enjoying this sunny day, putting up poultry netting and fencing, watering orchard trees, and sneaking in a siesta in after lunch. Thank you for the kind words and visit! Just baked this and my New York apartment smells heavenly! Thank you for this!